Why Do We Use A Dog Point Screw? Do you know how many applications use dog point screw in their assembling? 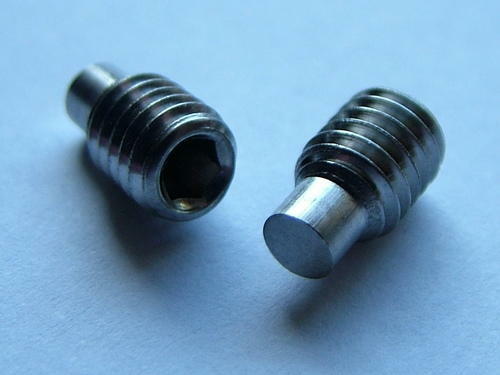 A dog point screw is actually a functional item for a variety of different industries and is easily applicable. Their simple usability and adaptability when being produced make them easy fasteners to deal with. What is a dog point screw? If you are not overly familiar with what dog point screws are or are used for, allow us to explain. A dog point screw is an industrial fastener designed with a flat, protruding tip. It is used traditionally to hold one or more objects in place both safely and securely. They are also commonly used in guiding industrial parts into drilled holes. They can be used in the securing of heavy-duty items when they are suspended off the ground or are in general need of support. An example of this is on an assembly line. They are easy to install, which means simplistic usability for whatever application it is being used. They are affordable. Dog point screws are reasonably priced by the likes of Pattern Fasteners, and so are easily obtainable for those who are in need of them without an extreme cost. Made of different materials, such as aluminium and brass to name a few. Made and designed for different characteristics. A dog point screw can be created to resist the likes of extreme temperatures and corrosion, even being made to factor in tensile strength. Made in different shapes and sizes. A dog point screw can be needed for various industrial applications and so when being manufactured they need to suit the requirements of what they will be used for. Pattern Fasteners are a leading company in the West Midlands that specialises in the area of precision components and fasteners. The company and team of Pattern Fasteners have years of experience in manufacturing standard and non-standard fasteners and also have a great many customers satisfied with their speedy turnaround time and customer service in general. To contact Pattern Fasteners about their bespoke dog point screws and how they can help you, call 0121 330 0854 or email sales@patternfasteners.co.uk for assistance from one of their helpful team members.